Serious wine drinkers and collectors will love this large, freestanding wine refrigerator. It holds 46 bottles, so you can store cases of your favorites or fill it with a variety of different wines to pair perfectly with dinner, no matter what’s being served. It has a triple-layered glass door, so you can see the bottles without losing the chill, and the glass will never fog. 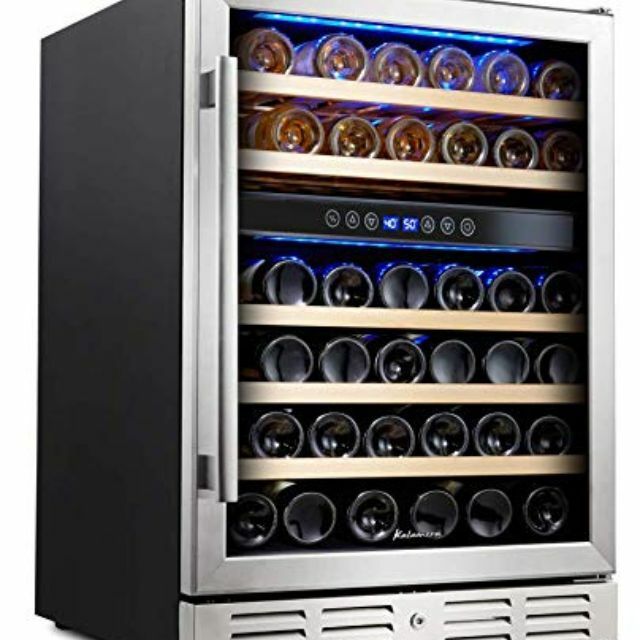 This has dual zones, so you can keep both red and white wines at their proper temperature. If the power goes out, this refrigerator remembers your custom temperature settings, so you won’t need to re-set it. Designed for quiet operation and low vibration, wine sediment won’t be disturbed in storage. Not only is this a high-quality refrigerator that will keep your wine safe and chilled, but it also looks good with black and stainless steel trim and beechwood shelves. When you like both red and white wines, it’s handy to have a wine refrigerator that can keep both at their proper temperature. This refrigerator lets you set the upper zone from 46 to 64 degrees, while you can set the lower zone from 54 to 64 degrees. The smoked glass door protects the wines from excess light, and the vibration-free thermoelectric cooling won’t disturb the wine sediment during storage. The insulation and the door are designed to keep humidity in, to keep corks from drying out during long storage. Soft interior lighting can let you see the wine, or you can turn the light off when it’s not needed. This Amazon bestseller has gotten great reviews from people saying it is a great first wine fridge and it operates at a near silent temperature. A few people have commented that this broke within a year of use so be sure to read the operating instructions carefully with the setup. If your wine collection has outgrown a small wine refrigerator, you’ll have plenty of space for storage with these side-by-side units. These are two separate units, so you can opt to install them next to each other so they look like one unit, or you can place them separately. Buying the pair saves you money over purchasing them separately, so you can buy an extra case of wine to help fill them. They hold 332 bottles, total, and the units can be used either as stand-alone units or they can be built in. The doors are tinted glass, and there is a security lock to keep the wine safe. The temperature controls have LED displays so it’s easy to set your desired temperature on each unit. The shelves are made from wire with a wood trim. The doors have hinges on the right, but you can customize the look by reversing one or both doors using the information in the manual. This 30-bottle wine refrigerator can be built-in under a kitchen counter, or you can use it as a freestanding unit, giving you plenty of options for placement. It’s got a double-layered tempered glass door that will hold the chill in while you can still see the bottles, and it will never fog from condensation. This is a single-zone refrigerator, but the temperature can be set for red or white wine, from 40 to 66 degrees. If the power goes out, the refrigerator remembers your setting, so your wine will always be at the proper drinking temperature. This compact wine refrigerator will hold up to six bottles of wine, so you can tuck it into a convenient place in your kitchen or behind the bar, and always have your wine at the proper drinking temperature. This is the perfect little wine fridge for small kitchens, but it would also be handy for folks who have a larger fridge in the basement or garage but want a more convenient place to keep just a few bottles handy for dinner. You can set the temperature from 46 to 66 using a small dial, for white or red wines. There is no thermostat, so you’ll need to adjust the dial and check the temperature with a thermometer to make sure it’s exactly where you want it. An internal LED lights the interior so you can see the bottles through the glass door. 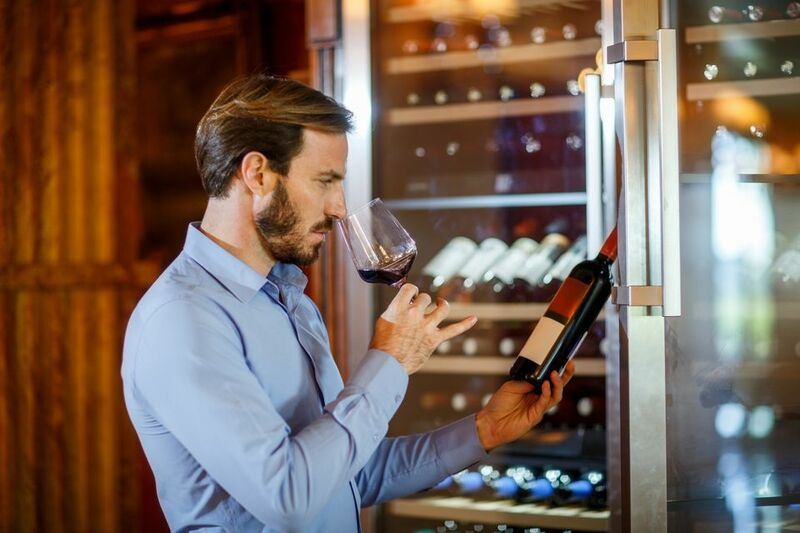 Perfect for people who buy their wine by the case, this cooler holds exactly 12 bottles of red or white wine, and you can set the temperature from 54 to 66 degrees. The thermoelectric cooling keeps the wine cool without any vibration, so wine sediment won’t be disturbed during storage. The stainless steel case will look good in almost any kitchen, while the glass door and internal LED will let you see your wine bottles easily. The three wire shelves each hold four bottles and slide in and out easily for loading and unloading bottles. Wine refrigerators are handy to have, but sometimes it’s hard to find space for a large, rectangular unit. This tall, skinny wine refrigerator is only 6" wide, so it can be built-in to a small space that might not be useful for anything else. This holds seven bottles of wine, and you can set the temperature from 40 to 65 degrees for either white or red wine. An internal fan circulates the cool air in the refrigerator so all of the bottles cool evenly, whether they’re on the top, middle, or bottom. This has digital controls for setting the temperature, and an interior LED light to display the bottles. When you love your red and white wines equally and want to display them in style, this wine refrigerator is the perfect fit. It holds 24 bottles, with 12 in the upper zone and 12 in the lower zone, with the digital touch-pad control placed between the two. The upper zone can be set for 54 to 66 degrees, while the lower zone can be set for 46 to 66 degrees. Thermoelectric cooling along with wood shelves give vibration-free cooling that won’t disturb wine sediment during storage. The cabinet is black, with stainless steel trim on the door, for an elegant, modern look. A safety lock lets you secure your wine, while an internal LED and tempered glass doors let you see the wine. The LED can be turned off from the control panel. This is designed for freestanding use, and the door needs to swing 180 degrees if you want to remove and replace the shelving. Our writers spent 4 hours researching the most popular wine fridges on the market. Before making their final recommendations, they considered 15 different fridges overall, screened options from 12 different brands and manufacturers and read over 15 user reviews (both positive and negative). All of this research adds up to recommendations you can trust. ﻿From our final list of wine fridges, we chose a top-rated model to test. Our testers spent 168 total hours setting it up at home, storing their favorite bottles, and observing its performance (which, of course, included drinking a glass or two). We asked our reviewers to consider the most important features when using this wine refrigerator, from its design to how many bottles it holds at a time. We've outlined the most important points here so that you, too, know what to look for when shopping. Bottle capacity Do you buy wine by the case and let it age for a few years, or do you buy bottles one at a time and drink them as you go? No matter how you buy and serve wine, there’s a refrigerator that’s perfect for you. Single vs. dual zones Single-zone refrigerators are ideal for folks who prefer red or white wines but rarely cross the border. For those who like both (and serve them on a regular basis), a dual-zone refrigerator is the logical choice since reds and whites have different serving temperatures. Size A wine refrigerator’s size affects both the number of bottles it can store and the location where it’ll be placed in your home. Do you have a tall, narrow spot in the kitchen or dining room, or would you prefer a wide, low refrigerator that’ll fit behind the bar?